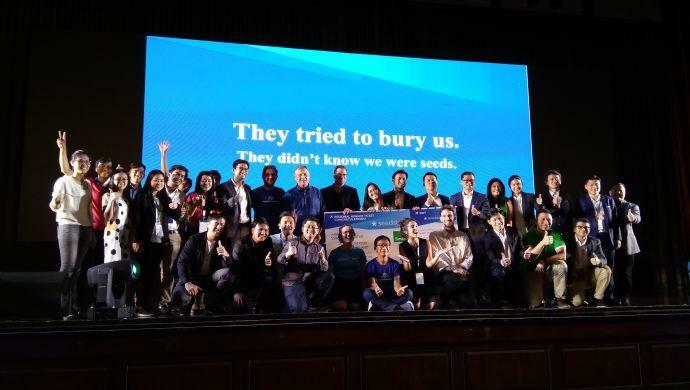 Logistics startup Joonaak has been named as the winner of the inaugural Seedstars Cambodia in Phnom Penh on Sunday. Selected out of 10 finalists, Joonaak is a startup that provides delivery and warehousing services for small businesses. In addition to winning a US$500,000 equity investment, the startup will also participate at the Seedstars Asia Summit in Bangkok later this year and compete at the Seedstars Global Summit in Lausanne in April 2019. “This event is all about taking risks and the willingness to try … Every entrepreneur knows that we should go out of our comfort zone, doing something we’ve never done before, but in reality there are things that just seem out of reach. Put your heart and soul into it, trust your team, believe in what you are doing is something that people also value, and it is very important,” Joonaak Co-Founder and CEO Soliya Kong told e27. The startup plans to use the funding to support their national expansion, with a long-term plan to expand to other Southeast Asian market. It will also use the funding for product development. To prepare for the next rounds of the competition, the startup plans to polish their presentation, business model, and revenue generation model. Apart from Joonaak, the competition also named Demine Robotics and Nham24 as second and third prize winners. Using a patented technology, Demine Robotics build robotics solutions for governments and non-government organisations to remove landmines in former conflict areas. The solution aims to provide a safer and cost effective mean to clear out landmines, and the startup has already secured a partnership with the United Nations Development Programme (UNDP). Nham24 is a food delivery service that helps customers save time with their meal booking. The app offers cash-on-delivery payment method and helps food businesses in Phnom Penh gets online. The competition featured finalists working in various industries from gaming, beauty, B2B, edutech, to non-government sector. Its panel of judges consist of Gaby Fernandez Scala (Seedstars Asia), Pahrada Sappasert (500 TukTuks), Bora Kem (Mekong Strategic Partners), Zoe Ng (Raintree), Sopheap Seng (NIPTICT), and Feiruz Ikhwan (Smart Axiata). Prior to the winner announcement, Seedstars Cambodia ran a two-day bootcamp session for the participating startups. During the bootcamp, participants have the opportunity to attend workshops and one-on-one mentoring sessions with both local and international mentors such as Pahrada Sapprasert (500 TukTuks), Toshiya Matsuo (Ookbee Mall, Transcosmos), Joseph de Leon (Gravitas Prime), Nichapat Ark (Openspace Ventures), and Paul Ark (Digital Ventures). Adriana Collini, from the Seedstars investment team, told e27 that she was “positively surprised” by the quality of the participants. “They said that this is the first time they have ever participated in such event, because they do not have the time to look up from their work … I feel honoured that they feel this is valuable enough for them to leave their office for,” she said. “They are very active, and they willingly share [their experiences]. It seems like the ecosystem is very collaborative,” she added. When asked about the challenges that these startups are facing in preparing their pitch for the competition, Collini said that many startups need to work on validating their ideas by using the proper methodology. “What they need is the right tools. For example, if you have a lot of ideas, where should you start?” she said. The result of a partnership with Smart Axiata; National Institute of Posts, Telecoms and ICT; and the Ministry of Posts and Telecommunications, Seedstars Cambodia was held in conjunction with the inaugural Cambodia Tech Summit. The summit also saw the launch of a tech startup ecosystem report by Mekong Strategic Partners and Raintree Development, which revealed a 140 per cent increase in startup funding announcement in the kingdom in 2018. The post Logistics startup Joonaak wins Seedstars Cambodia 2018 appeared first on e27.